A very demanding hole requiring a long drive to a split fairway. The approach shot requires accuracy as the green is long and narrow and is surrounded by water at the front right and heavily bunkered on all sides. The best approach is from the left of the fairway allowing an open approach but by playing the right side of the fairway the approach shot will be shorter but water and bunkers come into play. Hole 3 requires an accurate tee shot using the fairway bunker as the target. The long hitters can attack the green for an eagle opportunity but beware of the water which runs all the way down the right. All but the long hitters has to lay up with their second shot which will give them a short approach shot. The green is relatively generous but funnels to the left and is protected by bunkers on the right. A short Par 3. The green site is an island linked to the tee-box by a wooden bridge and surrounded by natural wetland vegetation and nibong palms. The large narrow green is protected by bunkers on all sides and will require a long putt if tee shot is not accurate. Hole 5 is a long par 5 with a generous driving target. Care must be taken with the second shot as a very large bunker awaits stray shots and water runs parallel to the fairway on the right. The green is large and subtle undulation will make 3 putting a strong possibility if the ball is far from the hole. Hole 6 has a dramatic foreground of wetlands vegetation and the left side of the fairway is framed by a rocky cliff and a large bunker. Short, stray tee shots will be penalized by O.B. left or hazard right. The green is flanked by 2 large pot bunkers and deep swails which fall away from the green. Hole 7 is a long testing par 4 played from elevated tee to a large green nestled in the lea of a steep jungle clad hill. A good drive, preferably to the right centre of the fairway is required in order to reach the green in regulation. Water and wetland approach run along the right side of the fairway. Their presence together with a pair of deep face bunkers guarding the green demands accuracy on the approach shot. Hole 8 is a long par 3 from elevated tee to a two tier pear shaped green. Correct club selection is vital particularly if the pin is at the back of the green. A long challenging par 4. Dense trees, wetlands lakes, waste bunkers, freefory and par bunkers, mounds, hollows and an undulating putting green surface all add to the challenge of this beautiful hole. A good drive is a must but beware of the 50m bunkers on the right. A long iron or wood for the approach will be required but accuracy is important as the green is surrounded by water and bunkers. Putting will be difficult on this large undulating green and a par will be truly satisfying. The wind blowing off the South China Sea makes this hole very demanding off the black tee. Beware of OB on the left. The left side is a jungle clad hill side. A relative easy 2nd shot is all that is required but a false front to the green could lay the approach short. Dalit Bay’s signature Hole is a relatively easy par 3 with the South China Sea surrounding the tee. The challenge lies cutting across the Tambalang river mouth to land the ball on a gently contoured green flanked by bunkers. The imposing sight of Mount Kinabalu in the background crafts a unique marking point for the pin. On this interesting par 5, a good drive to the left side of the fairway will set up a possible eagle opportunity. Water down the right side will give slicers added problems. Players choosing to lay up must be careful of the fairway bunkers and cluster of trees which are 130m from the green. An easy approach to a large green for the 3rd shot will give most a birdie opportunity. This par 4 is one of more challenging holes on the golf course. 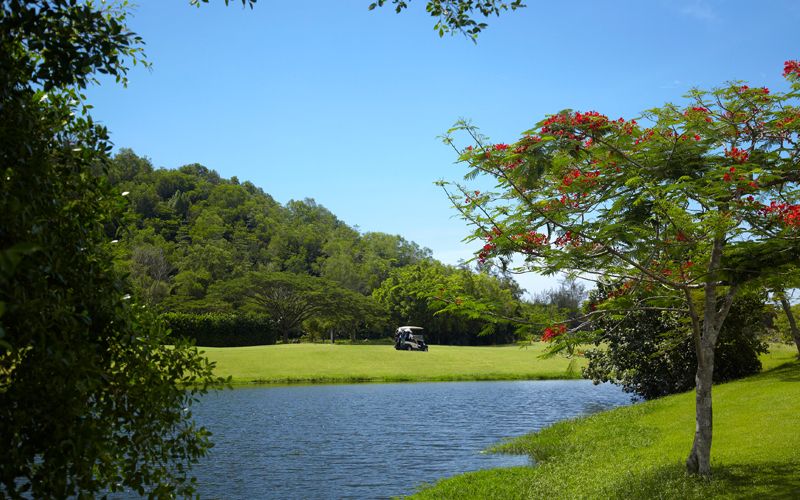 The Tambalang river runs parallel to the fairway all the way down to the left side which requires a force to carry off the tee of 180m to a narrow strip of fairway. Bunkers and water behind surround the green making the approach shot to the small green difficult. A par is a good source to come away from this hole. Hole 14 is a long challenging par 5 with the tee surrounded by mangrove wetlands. The big hitters can opt to cut the dogleg by aiming along the pond’s edge. The 2nd shot requires accuracy as 3 fairway bunkers are sited at the landing area. It is possible to reach in 2 if there is a tail wind but accuracy is a must as the green is relatively small. Slicers beware! Hole 15 with the water traversing the entire length of the hole provides an exciting challenge to golfers. At 389m and into the wind, only a solid tee shot will allow green in regulation for the aggressive players. To reach the safety of the long and narrow green the approach shot must negotiate 3 bunkers to the right of the green. Hole 16 is a good driving hole with a generous landing area. By ising the bunker in the distance as the target from the tee it will set you up for an easy approach to the elevated 2 tier green with bunkers on both sides. Tee shots that go right will end up in the casuarina trees requiring a sideway shot to lift out. This par 3 is enjoyable but tough with a tee shot across the lake to a generous green surrounded by bunkers. Look for Mount Kinabalu in the distance. The closing hole is 372m long with water all the way down the right side and the landing zone is well guarded by 4 strategically placed bunkers ranging from 220m — 250m from the tee. The right side is the best position for your tee shot which will allow a straight 2nd shot to the green. The deceptively undulating green is flanked by bunkers and funnels to the right.